Everyone who knows us, would know how involved we are in Art. Most young children are excited about doing a creative activity. My children are no different. You should look at the awesome creation mess they make each day! The right side of the brain is in charge of creativity and visual skills amongst others whilst the left side takes over sequencing, language, and Math. If one is able to marry the two together, I believe it will provide a gateway for students to write more creatively. Hence when we were invited to Artistic Strategies, a writing academy founded by Ms Claudine Fernandez, we were ecstatic! 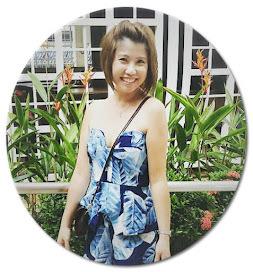 Ms Claudine had been an ex teacher with extensive teaching experience. She completed her Masters in Education in Harvard and went on to set up Artistic Strategies Academy, with the mission to bring more creativity to children's writings. "I founded Artistic Strategies because I had seen too many children feeling disenchanted or disinterested with writing. This was mostly due to the fact that they associated writing with boring memorisation and rote learning techniques and felt disconnected from the stories they were made to write. Such a shame, given that writing is such an important lifeskill! Something had to change. After graduating from Harvard University with a Master Degree in Arts in Education, I found the solution in marrying arts and writing, giving rise to our signature Artistic Writing™ program. I'm proud to say that we are the pioneers in Singapore. Many children love experimenting with different art forms as they are particularly enticed by the dynamic nature of the arts, which allows them to engage in hands-on, interactive and creative activities- instead of sitting behind their desks all the time." We first attended the Open House where they set up stations for children to have bite size experiences of the things they do in class. Big K was introduced to the first station where she had to create a clay character with plasticine. Wonderful to have gross motor skills incorporated into the activity. Children instinctively connect thoughts, words, and images long before they master the skill of writing. Big K hasn't been introduced to composition writing, hence I didn't really want her to be put off. My fears were cast aside when I saw her creating her masterpiece. At the second yummy station, children are given marshmallows as props. They were tasked to create they own kingdom. Engaging their sense, how clever! This is what a good composition should incorporate! The writing activity then follows. The worksheet Big K received had lots of scaffolding as I thought it would be a good way to introduce creative writing to her. The teachers will access your writing ability and cater to your needs. It isn't always a one sizes fits all worksheet. They do provide you with activity books and a customised writing kit used in their classes so that you can continue developing your child's writing skills at home. At the third station, Big K had to yup, you guessed it, invent something! Handson activities immediately include a student, no matter if they are advanced learners or an amateur. Big K didn't know, but we were secretly weaving in knowledge as she crafted. The activity provides a prosthetic, addressing the areas where she needed support. Look at her invention! Can you guess what it was? It's a rice machine! She probably knew that to get every grain of rice takes a lot of effort, hence, it would be wonderful if there were a rice machine in this world to provide us with endless supply of rice! After crafting, she had to describe her invention. Don't worry, if your child can't form sentences or she has issues with spelling, the instructor is always there to help! The last station she tried was the Origami & Haiku station. We all know that origami is the art of paper folding and has applications in modern-day classroom for teaching things like fractions, geometry, thinking skills and problem solving. So where is the language bit? Origami excites other modalities of learning. Research has shown that it improves spatial visualization skills using hands-on learning. Such skills allow a child to comprehend and construct their own vernacular for the world around them. This was a bit of a challenge for Big K as she chose to fold a crane! We had been folding chairs and tables but crane? Wow! that was another level altogether. I sat back and observed. She was following the instructions well and when met with an obstacle, the instructor would once again come by to guide her. Now the interesting part of this activity was that the child had to create a Haiku based on what she had folded. A haiku for your information, is a 3-line poem. The first line has 5 syllables, the second line has 7 syllabus and the third line has 5 syllables. This is literature but Big K was happy to attempt! When I told Big K that we were going back a second time, she was over the moon. She deemed it as fun. For the purpose to class, the ipad was whipped out. Now, I am usually not a screen-time kindof mom, but I do understand that given the rise in technological advancement, it comes as no surprise that the ipad and shows have become a dime a dozen. Teacher Claudine cleverly used the show Mona to entice Big K and a few questions were asked after a short snippet of the show. This builds comprehension and listening skills. Besides technology, we did say that the child was able to do some Art during the lesson right? Well, that was exactly what Big K did! She painted on a small canvas! You should have seen the sparkle in her eyes. Painting -- a love hate relationship which I have. Love because I myself am a rather creative person. Hate, well, the cleanup is a pain. So when she was able to quench her thirst for painting during class, I was thrilled. After all the art and technology, Big K was invited to another room where another instructor guided the children in writing and building up their repertoire of words. Of course all work and no play would make Jane a dull girl, hence, the instructor cleverly incorporated hangman (with a twist) into this segment, thereby introducing the new words to the children in a fun way. I really love how dynamic the lessons are. As a teacher, one should optimize the learning process and not simply using the static approach of drilling and that's exactly what they are doing over at Artistic Strategies Academy. Discovering Enchantia was written by an 11yo whilst Dinobuster was written by a 9 year old! Artistic Strategies has a highly sought after class during the June and December period. It is the Young Authors Programme. This is a holiday program where children can publish their own book and at the end of the day, proceeds go to charity. What a wonderful way to entice the child to write and not forgetting to show a little gratitude to life around. Can you imagine a young child publishing a book complete with illustration? I was excited to see and hear that! In order to maintain the standard of the books published, the number of students is kept low -- 5 per class. You are only able to join if you are selected! Extremely exclusive! Reason being, the process of writing a book is very tedious and the academy does not want to compromise the quality by doing a bigger class. Look at this! So meaningful! Written by a child! Written by a 9year old. 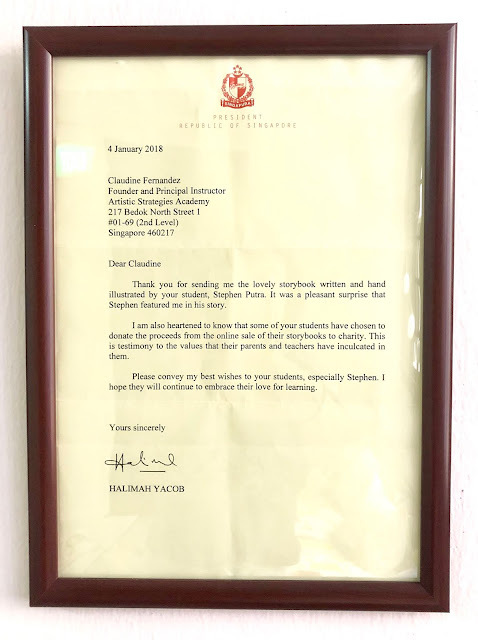 Our president Halimah Yacob actually came to know about this particular mention in the book on Dinos and wrote back to the 9 year-old author! WOW! Apart from the Young Authors Programme, they also have a host of other workshops on top of their regular weekly classes. Visual Storytelling (A photography and writing workshop); Speak up, Speak well workshop (one that helps build confidence for introverted children) and the Young Inventors Programme which is perfect for the budding entrepreneur. You may find more information on their website here. The concept of marrying art and creative writing is really a valuable idea. Particularly for these little ones who have bountiful imagination. It is wonderful to see how Artistic Strategies Academy is able to develop tasks to harness the power of observation, analysis and writing. Unlike several other tuition centres where they spam the child with bombastic words and standard plots, Artistic Strategy believes in creativity. In this century, where rote learning is frowned upon, being unique in plot is the thing which is going to get you far in grades. In fact, I have even heard of schools marking the child down due to obsessive usage of flowery phrases. Some teachers are even able to tell which centre the child attends, from the same style of writing. Needless to say, these scripts do not garner high grades. So how can we instill more creativity in their writing? It is to allow them time to explore and making learning fun through the use of various mediums.